Trade Me Property has upped the ante in the battle for property listings and potential home buyers by providing free sales histories on properties. At present if someone wants to look up the sales history of a property and see when it was last sold and the price it was sold for, they will need to pay for the information from organisations such as QV.co.nz. 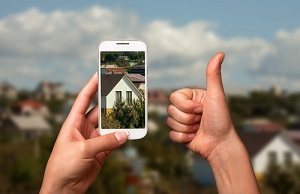 But with a new mobile app developed by Trade Me, when someone clicks on a property that is listed for sale on the website, they will be able to see when that property was last sold and its selling price, as well as the selling prices of other properties in the surrounding area. The app will also display the rating valuation and the land area and floor area of properties. Trade Me's head of property Nigel Jeffries said the sales histories would go back seven years and were initially available for properties in Auckland, Wellington and Christchurch but would become progressively available for the rest of the country. He said the ability to access selling prices of homes was one of the most requested features the company was asked for. "If you are a buyer, you want to do the best research you can and there's always been a big demand [for sales history information] but it hasn't been readily accessible unless you pull out your credit card, so it's definitely going to give us a competitive advantage," he said. At the moment the information is only available on an iOS (Apple) app, which restricts it to iPhones and iPads, but Jeffries said Trade Me would be launching an Android version of the app in the next week or so, which would make it available to a much wider range of mobile devices including Samsung ones. The image below shows how the sales history information for a property is displayed on a mobile device. Smart move. Wonder what they pay LINZ for the access. Will be interesting to see if realestate.co.nz follow. Wow. this is awesome!! I love where TM Property is going with this stuff. Waste of time for Christchurch residents. The data's all wrong, and it is missing a lot of sales. Bloody glad I never paid this service if this is the crap you get given. Wow, a move towards a free market in real-estate. Never thought i would see it in NZ. Looks to just be RV stats, on the main desktop site anyway. Interesting. Ugly as hell website but oh well. Who owns that website? Wow. http://property-banditlabs.rhcloud.com/ is so much better that the TradeMe solution. Open the search filters, turn off "Current listings", turn on "Show previous sales". The data is actually accurate and up-to-date. Great, so what's the new mobile app called ? Good move TM. Wonder if RealEstate.co.nz will make it available publicly, their sister site across the ditch already has this info for years.. I thought all the data are already available in Property Guru?? Yes for a price, this is free. Great news. It only took them 10 years to catch up with the UK. Next step they may even put asking prices on listed properties (non auction) although that may be a step too far. I emailed an agent last week asking to get an idea of price for a property listed as 'by negotiation'. Never heard back, they can't be feeling any effects from the slow down. Does this mean the service will only be available to people with smartphones?